Canning pumpking chips…now doesn’t that sound interesting!?! Yeah, to me too. When I first started this recipe, I have to admit, I thought that they were going to turn out more like a real chip…maybe like ketchup or roasted red pepper chips. Boy, what was I thinking!?! Preserving these pumpkin chips is a two-day process but not a difficult one. And, if you google it you will find that it is more common that you may think. Apparently, this recipe was developed by our ancestors around the turn of the century and shows up in all sorts of cookbooks from that time. It is a sweet dish with a beautiful rich colour and a sugary taste probably best served as a dessert. So much for that deep-fried potato chip I was looking for. 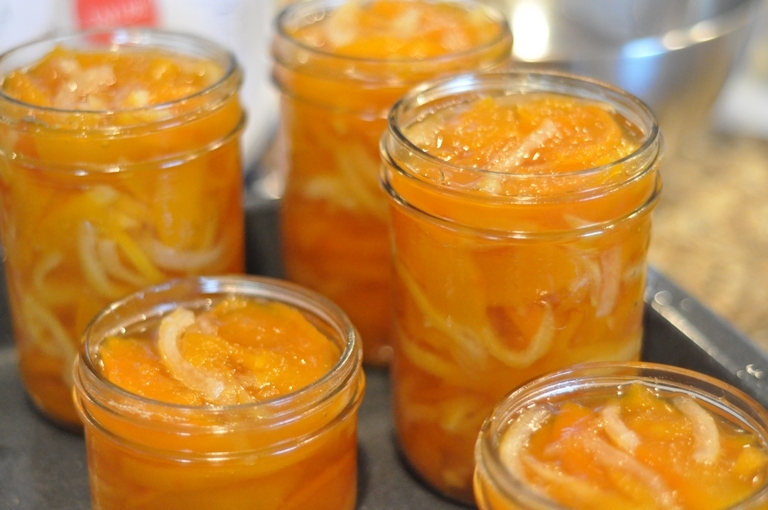 This recipe comes from Canning for a New Generation and takes two days from start to finish…with lots of time in between to enjoy your favorite episode of Law & Order or Dexter. Cut the pumpkins in half and scrape out the seeds and stringy mess. Use a vegetable peeler to peel them, then cut each half into 4 pieces and cut them crosswise into 1/16″ inch thick slices. 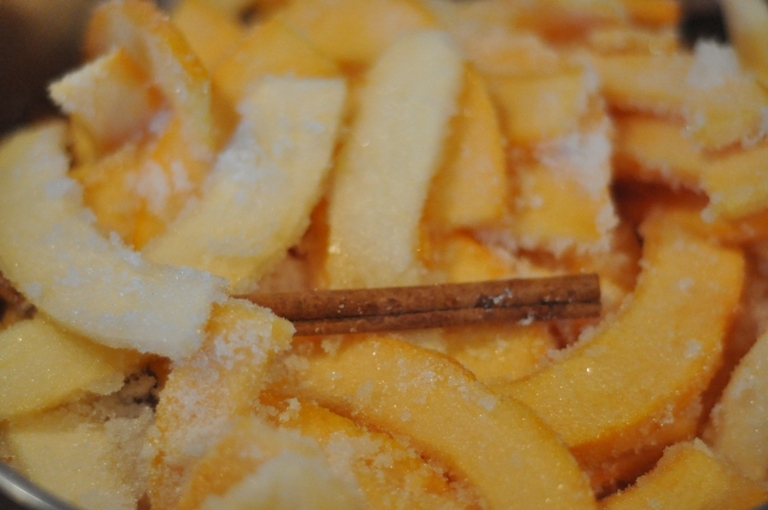 Layer in a wide, 6-to 8-quart preserving pan with the sugar, cinnamon, and star anise. 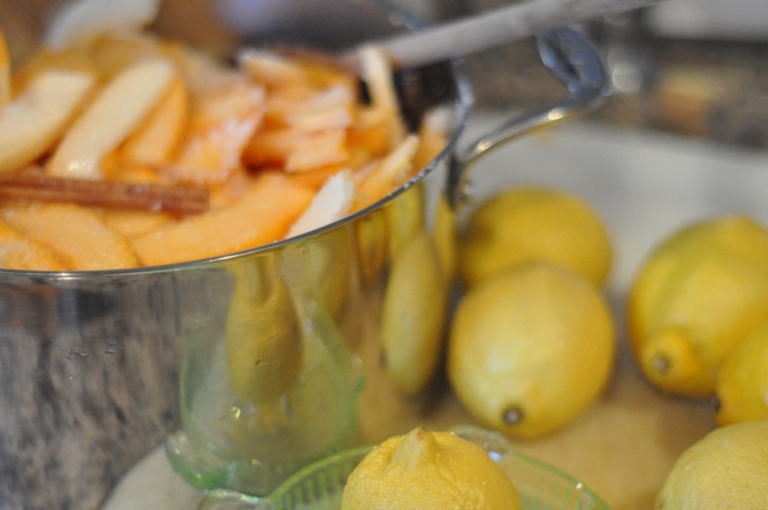 Cut the lemons in half and squeeze the juice through a sieve over the pumpkin mixture; reserve the lemon hulls. Toss to combine, then cover and refrigerate for 8 hours, or overnight. 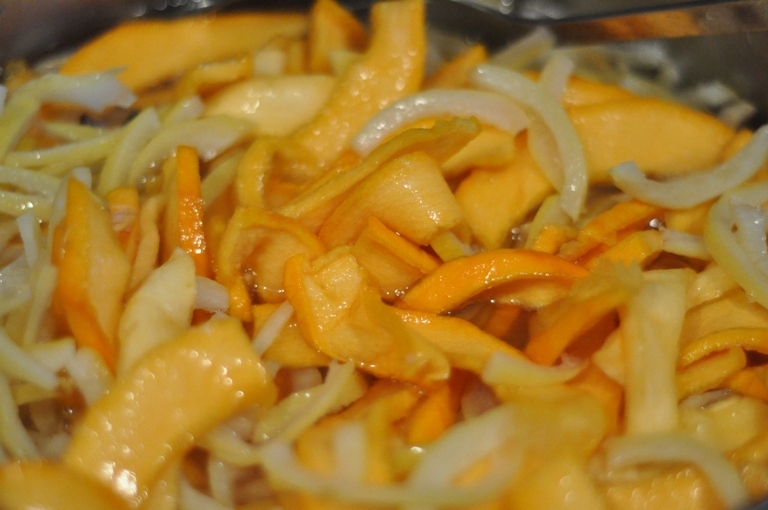 Use a sharp knife or a spoon to scrape the membranes and flesh out of the lemon hulls, then cut the rinds into thin slices. Put in a small saucepan and cover with cold water. bring to a boil, cook for 5 minutes, then drain. 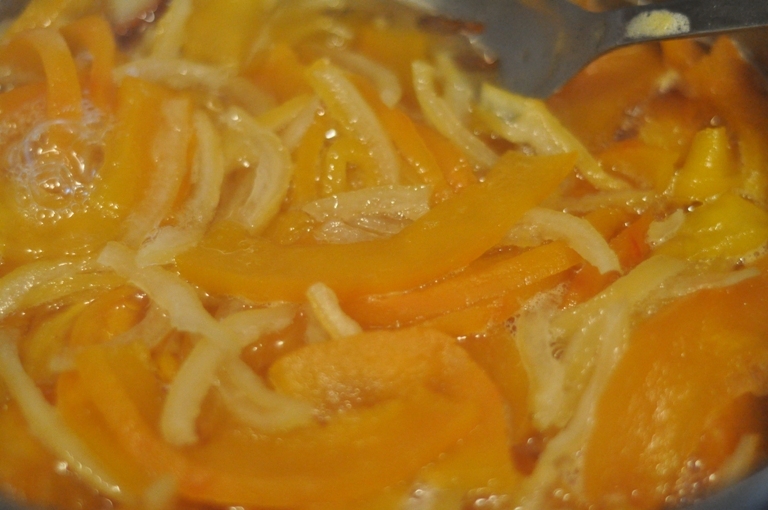 Repeat the boiling and draining 2 more times, then stir the lemon rinds into the pumpkin mixture. 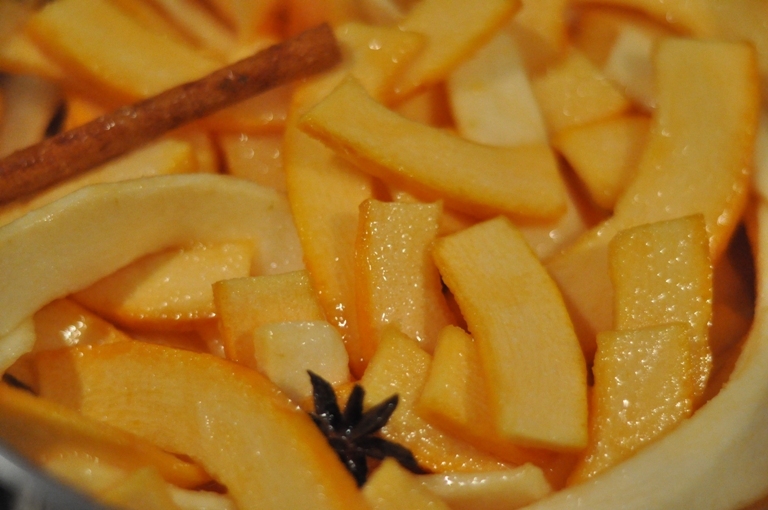 Bring to a boil over high heat, then lower the heat and simmer briskly until the pumpkin slices are evenly translucent, about 1 hour and 15 minutes. 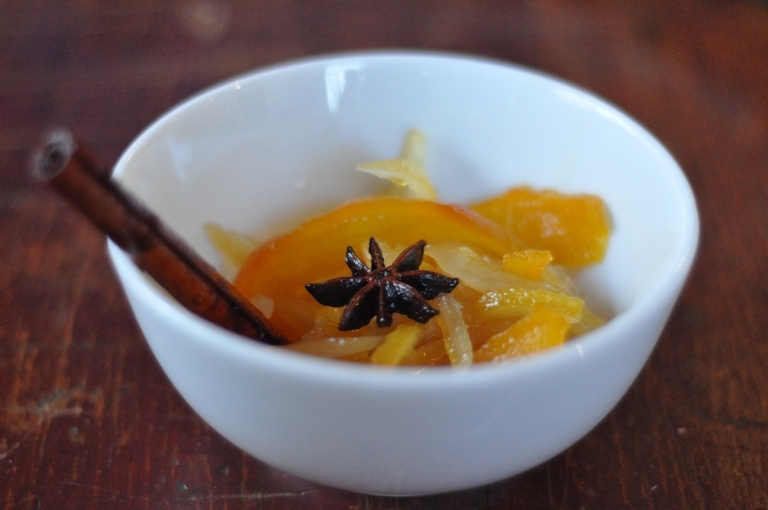 Ladle the hot pumpkin and syrup into sterilized jars, leaving 1/4″ inch headspace at the top. Use a damp paper towel to wipe the rims of the jars, then put a flat lid and ring on each jar, adjusting the ring so that it’s just finger-tight. Place the jars in the water bath, making sure the water covers the jars by at least 1″ inch. Bring to a boil and boil for 10 minutes to process. Turn off heat and remove lid, leaving the jars for 5 minutes before removing. Let cool, check seals, label and store. Voila…ready to serve. Now, that wasn’t so difficult. They are really tasty with a cinnamon sugary pumpkin goodness that is hard to describe. I think they will make a wonderfully unique dessert and won’t your guests be surprised to find out that this is a pumpkin chip? Oooh, this sounds so yummy! I was thinking about growing a little patch of pumpkins – now I think I definitely will. These are gorgeous! I bet they’d be great with ice cream or a crumb topping. Mine didn’t look anything like this. Mine ended up like jam. 1/16th of an inch thick slices for me turned into mush after 45 minutes.